Alastair Cook made his first Ashes century for almost seven years to lead England’s resurgence on day two of the Boxing Day Test in Melbourne. The 33-year-old, in his 151st Test, reached his hundred in the final over of the day to take the tourists to 192-2, a deficit of 135 runs. That came after Stuart Broad claimed 4-51 as the home side were bowled out for 327. Australia, who have already secured the Ashes, looked set to push on from an overnight 244-3, with Steve Smith (76) and Shaun Marsh (61) extending their partnership past 100. But when captain Smith became Tom Curran’s first Test wicket, it began a slide that saw the hosts lose their last seven wickets for 67 runs. On a slow surface, Cook blunted an Australia attack already without the injured Mitchell Starc and further weakened by a stomach upset suffered by Pat Cummins. The left-hander passed 50 for the first time in six Tests, then had the good fortune of being dropped by Smith on 66. When England won the Ashes down under in 2010-11, Cook piled on 766 runs but has not reached three figures against Australia since the final Test of that series. Here, he played with increasing freedom as a crowd of 67,882 gradually emptied to leave the Barmy Army singing the former captain’s name. Cook shared an unbroken stand of 112 with successor Joe Root, who is 49 not out. On day three, it will be the goal of the third-wicket pair, and the rest of England’s batting, to earn a lead large enough to negate batting last on a surface on which the bounce could get lower. The failure of England’s senior players on this tour has been a key factor in relinquishing the urn. Before this Test, Broad had taken only five wickets and Cook had mustered 83 runs in six innings. Indeed, ex-captain Michael Vaughan had questioned Broad’s place in the side, while former spinner Graeme Swann doubted the “longevity” left in Cook’s international career. Broad, though, responded by picking up his best figures for a year and Cook showed his trademark patience, composure and judgement to sap Australia’s bowlers in temperatures in the mid-30s. 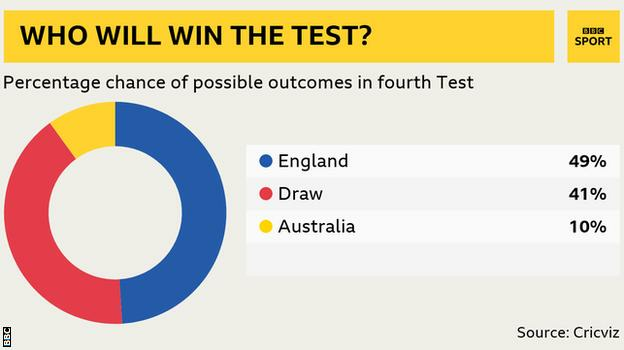 The result is a turnaround in a fourth Test where Australia were 102-0 on the first day and later, at the close, in a position from which they could have batted England out of the contest. Even if they still have plenty of work to do, England have a real opportunity to end an eight-match losing streak in Australia and escape the humiliation of another whitewash. England have been guilty of squandering strong positions throughout the series and they lost two wickets in very different circumstances. Opener Mark Stoneman made 15 before offering a leading edge to off-spinner Nathan Lyon, who took a wonderful, one-handed return catch above his right shoulder. And James Vince was lbw to Josh Hazlewood in the second over after tea for 17, with replays showing that he would have been reprieved by an inside edge had he asked for a review. Cook, however, stood firm at the other end, moving his feet with certainty and showing an intent to score. The left-hander played wonderfully straight, but also punished anything short to accumulate square on both sides of the wicket. Cook’s moment of fortune arrived when wicketkeeper Paine came up to the stumps to Mitchell Marsh and, from the next delivery, he edged to slip. Smith tumbled and made two grabs for the ball before it hit the turf. Root, meanwhile, busily earned his runs off the pads and behind square on the off side. On 93 as the final over the day began, Cook was greeted by Smith’s part-time leg-spin. He bunted a full-toss for four, scampered two more, then pulled a century-clinching boundary. Earlier, England got their rewards in the field with the help of some good fortune and poor Australian batting. The lack of pace in the pitch was highlighted by three players chopping the ball on to their own stumps, the first of which was Smith. The skipper, 65 not out overnight, began in ominous touch and looked nailed on for a fourth successive century in Boxing Day Tests. But, to Curran’s second delivery of the day, he tried to force an innocuous short ball through the off side and disturbed his own stumps to be dismissed in Melbourne for the first time since 2014. Broad bowled with good pace on a full length and was rewarded when Shaun Marsh, who passed 50 for the third time in the series, was given out lbw on review. 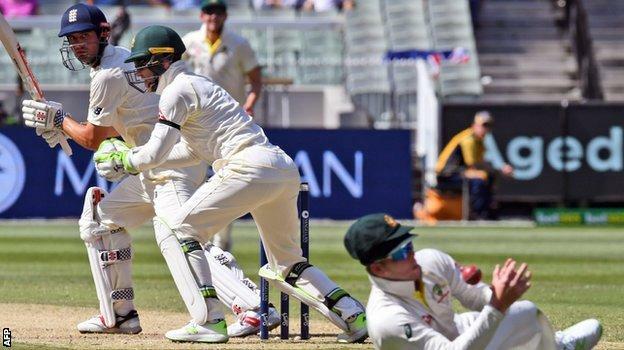 Australia’s tail has so often frustrated England, but after Tim Paine’s breezy 24 was ended with a play-on off James Anderson, the hosts lost their last three wickets for only two runs. Former England captain Michael Vaughan: “It has been a tough tour for the senior pros but for the first time the experienced batsmen have been at the crease for a few hours. “Throughout the whole day Cook had a mindset of challenging the bowler. The pitch played beautifully in the afternoon session. “England are in a fantastic position and have won day two convincingly. Can they win day three? Australia’s Josh Hazlewood, speaking to ABC: “They are a little on top. We were a little inconsistent but it is a very good wicket. We could have bowled straighter and dried the scoring up.